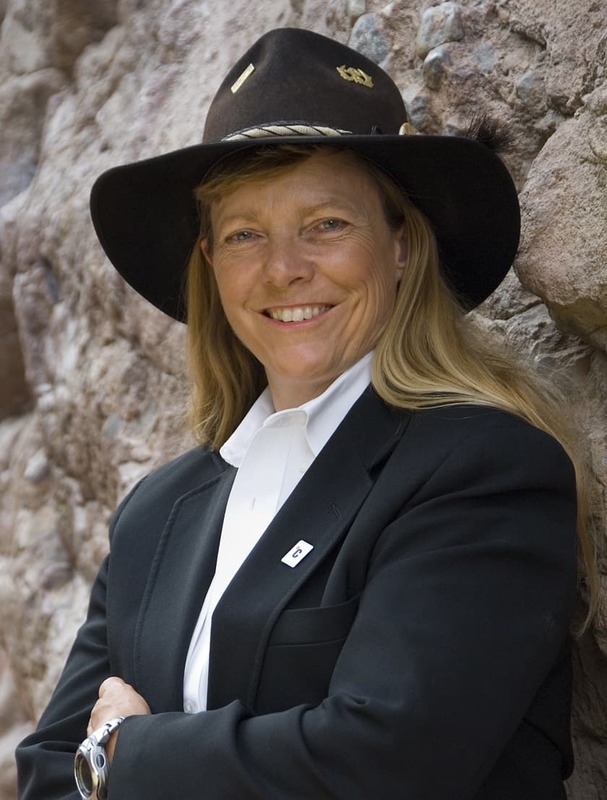 L. Hunter Lovins has been our featured guest this week on Facebook and Instagram with a book giveaway of her new book, A Finer Future: Creating an Economy in Service to Life, co-authored with Stewart Wallis, Anders Wijkman, and John Fullerton . Her thoughtful and direct answers to our interview and readers questions have be alternating between despair and determination. 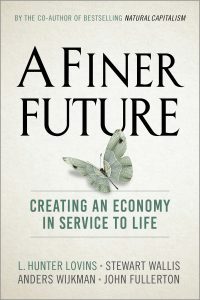 A Finer Future is the tool we need to move forward in creating a hospitable future. 1) Current economic models are divorced from our finite resource base. What is the best model you have seen to address this and why? The model of a regenerative economy as set forth in John Fullerton’s great paper, Regenerative Capitalism. Some might say that it is not an economic model as such; that it is a guidance on which an economy should be operated. But that guidance is a model. Models can be explicit tools for predicting outcomes, informal mental models, or a set of guiding principles. Regenerative Capitalism does not purport to be a predictive model, but in 40-plus years of looking for ways to frame how to organize our economy, this is the best starting place I have found.It is important to note that all models are wrong, but some models are useful, as Dennis Meadows, one of the authors of Limits To Growth, says. Limits to Growth was the book that resulted from running the massive MIT model, World 3, which explicitly sought to include what you rightly frame as our finite resource base. The various runs of that model that formed the basis for Limits to Growth found that unless we adopt what the authors called “sustainability” [first use of that term in the English language] as a basis for running our economy, we would collapse, pretty much as the world is now doing, at some time between now and about 15 years from now.More recently, as we describe in The Finer Future, Graham Turner revisited those runs of the MIT model showing that we are squarely on track for the worst of the collapse scenarios profiled in Limits to Growth.Many people say that Limits to Growth was wrong: we haven’t collapsed. But, as we describe in A Finer Future, many scholars now warn that overusing our finite resources will drive collapse, and that unless we dramatically shift course, collapse will become inevitable. As I wrote in the blog on this site: authors like Umair Haque write that collapse is unavoidable. Venerable conservative George Will writes: Another Epic Economic Collapse is coming.It is way past time to put Fullerton’s model of Regenerative Capitalism to work. Based on the principles of how nature works, it is the starting place for constructing an economy in service to life. 2) What would you say is the most important action a person can take to help create a regenerative economy? Join (or create) a local regenerative hub. These hubs, being created by citizens in various communities around the world, and facilitated by John Fullerton’s Capital Institute, are the basis for creating locally-based, regenerative economies. John and I were recently down in Costa Rica to help create a regenerative hub there. In the event, we appear to have helped create a cluster of five hubs, four in biosphere-based Territories.If there isn’t a hub in your community, gather a group of friends, colleagues, neighbors, and start talking about what it would take to create a regenerative economy in your area.For example, when we began creating a regenerative hub in the Boulder/Denver area, where I live, we started by looking at what the current economy looks like. In Colorado, the myth is that we are an extractive industries economy. It turns out that we are far more an economy of the outdoor industries, services, cannabis, education and natural foods. Extractive industries are part of the old, degenerative economy. The real economy in Colorado is far more regenerative of human and natural capital, than our historic economy of mining, oil and conventional agriculture. So one of the things we will do, when John comes to talk to our community 9 October, as we launch our hub, is make these findings known.Then it will be up to citizens, our elected officials, local companies, communities of faith and others to begin to build on what we have that we love, as we prune away the parts that are compromising our chance to have a finer future. At a minimum, find the companies in your community that are behaving in more regenerative ways and buy from them. Get to know where your food comes from and choose food from farmers’ markets. Buy holistically raised meat and vegetables. Seek out B-Corps and make them your preferred suppliers. Choose to support the real, local economy, not companies who are opaque as to their supply chain, are not part of a circular economy, and have not committed to 100% renewable energy. Create the economy in which you want to live by voting with your dollars. 3) In your book, you use the term “Cheater Capitalism” What do you mean by that? Randy is right. It’s cheating because it is not counting the cost to all of us of treating the earth as a business in liquidation. As cited in A Finer Future, Trucost found that if the losses of ecosystem services were properly counted, no business on earth would be profitable. The hundred biggest ways in which companies are harming natural capital are costing the economy at least $4.7 trillion every year in lost ecosystem services and pollution costs, none of which are ever repaid by business. These are real costs: sick people and lost services like clean water or fertile soils that nature used to provide for free, but for which we now must pay. That’s cheating, and is robbing us all of a shot at a finer future. This approach to business is also bad capitalism. Capitalism ought to steward and enhance all forms of capital, not merely maximize the money and stuff held by the those who sit atop the economic pyramid. The coherence of human community, the ability of society to pass on adaptive values, the integrity of intact ecosystems and all of the services that nature provides to us are all crucial to the creation of wealth and well-being. They are irreplaceable forms of capital: assets that enable us to create what it is that we truly value in our lives. As we detail in the book, seeking to maximize money and stuff at the cost of destroying natural and human capital is bad business and bad capitalism. The companies that behave responsibly to our earth and ourselves are more profitable, have the fastest growing stock value, are better able to attract and retain the best talent, grow their market share and avoid myriad risks. Capitalism is under attack. I believe we need to evolve to a new economic system: regenerative capitalism that knows its place in society and the biosphere, defines wealth holistically, fosters circularity, harvests the abundance that diversity and the edge effect deliver, finds balance between efficiency and resilience, fosters entrepreneurialism and adaptation, empowers diverse participation and perhaps most important, honors place and the integrity of all local communities. Maybe we need a new word for this way of organizing and governing our economy and our society, but it will be based on human dignity and well-being, and as Alex Steffen wrote so beautifully in the closing lines of A Finer Future, enable us to be heroic ancestors that future generations will revere. 4) How do you maintain your optimistic outlook given the in-depth knowledge you have of the damage being done by current economic structures? I teach. My classes at the Bard MBA, the students to whom I lectured last week at Stuart Hart’s Sustainable Innovations MBA at the University of Vermont, the young entrepreneurs I will mentor this fall at Unreasonable Impact are all so committed to crafting a finer future that I owe it to them to do my level best to convey what knowledge I have about how to make a difference. We have all of the technologies and a goodly number of the concepts we need to solve the most proximate problems facing us and thus to buy time to tackle the ones we don’t yet know how to solve. When I feel despair, the antidote is to take action. DOT: do one thing. Just one, if that is all that is in you, but do that one act. Every day. It’s not given to us to know the outcome, only what we will do day by day for so long as we have that ability. Reader’s Question: Now that the rate of change on our planet and for we humans, (ie. biometrics. AI), how do I as a senior person 60+ help the new economy and be mannerful? Short answer: Hold to the goal of being mannerful. Be the example that others remember because you are the sort of person they love to be around. But also speak your truth. And take action. I have had many young people tell me that the platitude that we of the older generation have made a mess, now it is for the young people to fix it is unacceptable. They want our help to do it alongside them. And while the old joke of “hire a teenager while they still know everything” has some truth to it, the young are hungry for mentors, and more, for partners. We can take the risks that they may feel that they have to take, given the seriousness of everything happening around us, but we should be the ones to step forth first. At the recent marches, the signs held by grey-haired older women saying “I can’t believe I still have to protest,” make me smile. No, you shouldn’t have to still be marching, and yes, you still do need to be doing it. With your children, and their children and with all of us. I just had the privilege of sharing a panel with Dr. Neva Goodwin, one of the founders of the whole new economy movement, and still one of our wisest scholars. She is mannerful. And elegant. And brilliant. I have much to learn from her. So please, keep on being mannerful. But look around you every day. What in your community needs fixing? How can you buy from local merchants, and avoid the chains, so that the emerging bits of the new economy in my community flourish, and how can you talk to your friends and neighbors and enlist them in this, as well. If you are able, look for the situation where you can stand up for those who would risk it all if they stood forth. Listen to the young, then ask how you can help. Together craft a course of action. Empower them to lead, but be one they can lean on when they stumble and are unsure. And when you are done with this book you have won (congratulations) share it with a young person. I’ll be honored to send you another one. Thanks for still being out there. Thanks for still caring.